In air traffic it is a joke that an Air Traffic Controller tells pilots where to go. But a Flight Service Specialist tells pilots where NOT to go, and his method of doing that is by using a standard weather briefing format. VFR or IFR This tells me whether or not you, as the pilot have the training and instrumentation to fly through clouds. I am not making a judgment as to whether a pilot SHOULD go IFR or VFR, it is not the briefer’s job to determine a pilot’s abilities. I want to know what you, the pilot, want to do, and whether or not I need to let you know that VFR is not recommended or if I need to read to you two pages worth of arrival and departure navaid NOTAMS. Aircraft ID or Call Sign All briefs, radio calls, and other data are recorded by the aircraft’s call sign – not the pilot’s name. The computer requires this entry to get us to the briefing data. Also, if someone is overdue and a panicked relative calls us, be sure they know the aircraft ID. If you know that you are going to be renting an aircraft, but you do not have a tail number yet, then we can list it as NOACID and put the pilot’s name in remarks, but if you want to make sure your bases are covered, try to have it available. Type Aircraft Let’s face it, I am going to brief a small aircraft differently than a Learjet because Skyhawks do not usually need jet stream information, whereas a Learjet could care less about cloud bases enroute. This section has elicited a lot of confusion over the past few years. Many pilots do not recall that there was a widespread re-identification of aircraft types about 10 years ago. It was one of those FAA documents that went out to everyone that says that after 30 years of a Cherokee being a PA28, all of a sudden it is really a P28A. It did not really matter much to the private pilot because he could still call his flight plan over to FSS and the old computers would take PA28 as usual. However, the new FS21 computers “know” that there is no longer a PA28 or a HS25 or a T-45 type of aircraft – so they will not accept the flight plan until the correct aircraft type designator is used. If you have any questions as to what your identifier is, Flight Service can help you look it up. Also, we only have 4 spaces in the Aircraft type section of the flight plan form. I know you love your airplane, but if you tell me you have a Turbo C210 Retractable with all kinds of fancy modifications…..well, that’s nice……all I have room for on the form is C210. Departure Point-Route-Destination Ok, it seems obvious, but I cannot tell you how many times a pilot wants to go from Albuquerque to Phoenix., but neglects to tell us that they are doing it by way of Silver City, or that he is really departing Albuquerque’s Double Eagle Airport going to Chandler Municipal in the Phoenix area. Unless the right data is given the first time, I am not able to get the specific weather and NOTAM information for your airport, and if I am assuming a direct route, then I would not be telling you about a TFR for forest fires near Silver City. Be sure you know the identifiers for your route of flight. You’ll be on the phone longer if I have to look them up for you. And even if you are VFR, please list your route according to aviation NAVAIDS or airports – the computer does not recognize lakes and highways. If you file a flight plan you can add lakes, highways and/or towns in remarks. Altitude I am fairly good at guessing at what altitudes various aircraft can fly, but if you want the wind forecasts – give me an altitude. I am frequently surprised by experimentals, or by the rare supercharged turbo Cessna 172 and could easily guess wrong. Also, it’s OK to ask for winds at several altitudes and the briefer’s opinion as to which altitude would be best. What cracks me and most of the people I work with up, is when the pilots “blame” us for a headwind and thank us for a tailwind! If you just cannot get the conversion mentally, a cheat to this is to simply say you are leaving in 30 minutes or 5 hours. Then I can glance up at my ZULU clock and add it quickly. Remember when you are filing a flight plan that it stays in the computer of the agency that you filed it with until an hour prior to the proposal time, then it is transmitted to whatever AFSS or Center will be activating it. So if you call for departure more than an hour prior to the time your flight is proposed for, and you filed with DUATS the Tower (if IFR) or Radio (VFR), may not have received it yet. Also, the flight plan stays active on Tower and Radio proposed list for two hours past the proposal time before dropping out. Time Enroute This of course allows us to calculate the time period for which we need to scan for forecasts and NOTAMs. The computer system is designed to route your call to the place you request first, but if all the Briefers for that location are busy, rather than keep you on hold it will look for someone who normally Briefs in the next adjacent area. However, if there is specific information about the airport or terrain you are flying into, you may want to ask the computer to route you to a briefer that handles your destination airport. Any Flight Service can file flight plans from anywhere in the country, but if you want to know specific data about flying restrictions around the Grand Canyon, you might want to ask for Arizona. Keep in mind that because weather is always updated between the hour and 5 minutes past the hour, the best time to call for a briefing will always be 10 to 20 minutes after the hour. The worst time is between 5 minutes till and 5 minutes after the hour. In most flight service stations, we do not perform the same duties continuously. To keep from getting stale, we rotate from the Pre-flight briefing position, through Flight Data, Radio, Flight Watch and other specialized positions every few hours, and we usually start this dance at 5 till the hour. For about 10 minutes, the specialists are giving and receiving our transfer of position briefings and changing the computer settings. As a result, this is when you will run the highest chance of being on hold. Following the above format as you request a briefing is easiest for the briefer because she or he is tabbing between fields in the computer as you speak – if you give us the above data out of order, we may end up asking you to repeat information several times as we jump around on the page, wasting a lot of your precious time! 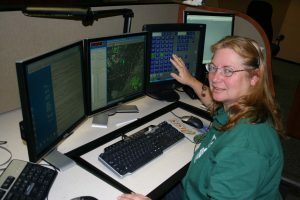 Rose Marie Kern has worked in ATC for over 32 years. If you’d like to ask Rose a question send her an email at author@rosemariekern.com.